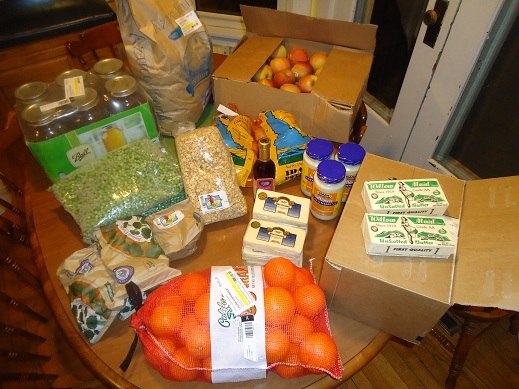 My Latest Grocery Purchases – and Check Out Azure Standard’s New Program! Right? You’ll all been asking yourselves these questions. Well, I didn’t get a picture of it, but I recently bought 20 pounds of butter. See, my local friends know me well enough to text me when they’re at the store and come across a good deal on butter. I got the text, I went to the store, and I got 20 pounds of butter. The check-out lady asked me what I was up to. I told her it was just another routine day in the life of me. No big deal. My current favorite of all vegetables are the amazing miniature sweet peppers that typically come in a 1-pound package. Do you know the ones of which I speak? I like cutting them up and eating them in salads. I like eating them as if they were candy. They are my fav. And yes. I’m still eating plenty of greens. If you’d like to see some of the items I’m receiving this month in my Amazon Subscribe and Save order, take a peek here. I kind of blew it on my recent Azure Standard order. How, you ask? Well, I ordered a few items and checked out with the intent to go back and order a few more of my Azure favorites before the cut-off date. Then I forgot. Oh well. 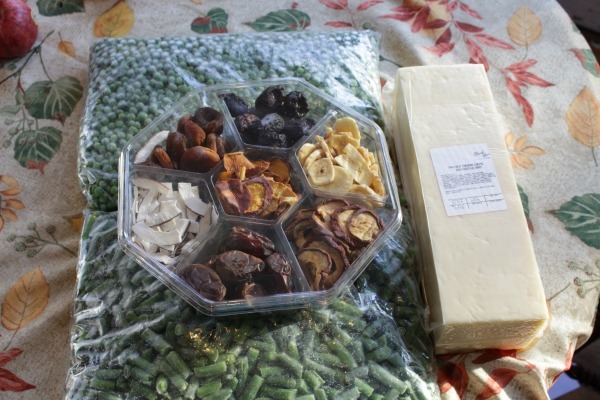 At least I got the frozen veggies I always need, I got a very wonderful and large block of raw cheddar cheese, and I got my very fun Azure Advantage Discovery Box. Those boxes have been the coolest! This month it contained a lovely assortment of high quality dried fruit. Azure is a food co-op that has been fantastic to me during the past 10 years that I’ve taken advantage of what they offer. I order online, then once a month, a truck delivers my order along with everyone else’s from my area. We meet in a parking lot, grab our boxes, then take them home and gush over the goodness. Gives me deeper discounts on bulk items (yes, please!). Sends me a Discover Box every other month, which more than makes up for the cost of my membership. I signed up for it hesitantly, but now I’m very glad I did! The membership cost is worth it for me, and I love the freebie boxes! You can check out Azure Advantage here. Anyone ever tried that block of cheese from Azure? I’m excited to grate the entire thing in my food processor for cheesy convenience. Does Azure Standard Deliver To You? Their prices are very reasonable (much less than a typical “whole food” grocery store). I can shop their online site and place my order easily. Their delivery truck drives right to our town every month. Their food is top quality. See, I went from buying poptarts with coupons and doing everything I possibly could to get cheapo groceries to learning that we needed to revamp our entire diet. The financial burden of this felt enormous to me. Plus, I live in a small town where there are very few organic options. So when my friend told me about Azure Standard, I felt I’d been given a gift. Through the years, I’ve saved oodles of money and time by shopping Azure Standard. Their healthy options are abundant! Matt and I are even buddies with our truck driver. Ultimately, we feel that Azure is family. They are great in every way. Where does Azure Standard deliver? There are hundreds of routes all over the U.S. Check here to see if there is a route near you. More than that, I recommend you read over this page to learn all about how Azure Standard works. It’s the least complicated co-op I’ve been a part of, which is why I’ve stuck with it for so long! Here’s a picture of one of my Azure orders from a few years ago. What’s more is that if you don’t see your state or area on the delivery route list, you can contact Azure Standard to let them know of your interest (routecare@azurestandard.com). They want to hear from you so they know how they can serve best. If there is enough interest in a particular area, they may try to add a route that comes to you! Look over this page to learn the basics about what Azure offers and how it works. They’ve served our family well for many years. How great that they are continuing to provide great service and grocery options to many more families! Since I took a picture last week of my grocery store trip and so many of you seemed to enjoy it, I decided to take a picture of this week’s Azure Standard order for you. This month, I ordered loads of fresh produce, a case of white cheddar cheese, and five pound bags of frozen green beans and peas. We got a 20 pound box of organic braeburn apples, plus a 20 pound box of pink ladies. There will be no limits on apples eaten for snacks at our house! Asa makes a mean Homemade Guacamole, so the avocados I got will be handed to him in a few days to make us some dip. I got a lovely two pound bag of kiwi, some lettuce, leeks, and tomatoes. Aahhhh, so many delicious options for my family! Now, let me explain my crazyness bulk potato purchase. You see, last month I ordered 50 pounds of potatoes but they didn’t come in. So what did I do this month? 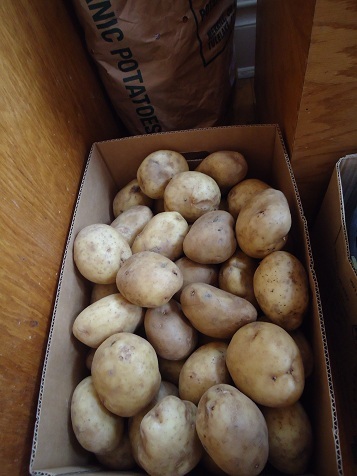 I ordered two different varieties of 50 pound potato options, hoping that this would ensure that we’d get at least one 50 pound box of potatoes. Both were good deals, both were organic. What will I do with 100 pounds of potatoes? Well, feed them to my family, of course. I’ll make French fries and baked potatoes and mashed potatoes and hashbrowns for the freezer. In addition, I will likely bag some of them up, drive around town, and deliver them to some of my friends. Nothing says “I treasure our friendship” like the gift of a bag of potatoes, right? Oh how my friends must roll their eyes at me. We plan to get a good start on the potatoes tomorrow since it is Justus’ 13th birthday and he has ordered homemade fries to go with our lunch. I gasped when he first requested this, asking if he thought this was a wise choice, seeing as we only had 100 pounds of potatoes to get us through the month. He smiled, because he’s sweet. But I’m pretty sure inside, he was rolling his eyes too. On second thought, he may have really been calculating how many potatoes we really could eat tomorrow since there was no need to hold back. Do you have the privilege of ordering from Azure Standard? Are you a part of a different food co-op? What would you do with one hundred pounds of potatoes? Covenant Ranch Trucking – Delivering for Azure Standard. Can You Benefit From Their Services? If you’ve been reading here long, you know how much I love ordering groceries from the health food co-op, Azure Standard. I just wanted to take the time to explain a little bit about what Covenant Ranch Trucking is to see if they are able to benefit you where you are. To CO (on the 70 and south of the 70 coming down the 25 into NM). If none of these locations matches where you live, you can read more on this post to see if Azure delivers to your area. Here is what Mrs. Joseph Wood, who has been working with me on this to get the word out about her family business, has shared with me. Let me share with you some of the ways we are hoping to be a blessing to others as well as grow the routes and spread Azure Standard. Azure Standard is unable to compensate drop managers due to federal tax regulations. However, as a company, Covenant Ranch Trucking, we are offering all our drop managers free shipping for their order for each month they meet our average drop total of 3000.00 (that is the average drop on our routes). We will help advertise a drop on FB, on the blog, send catalogs, flyers or assist in any other way. We hope that it is a blessing to those that volunteer their time to serve in their community. Also, if they refer someone who starts a drop that drops total goes toward their 3000.00 as well! It really is easy to do. Again this is coming from Covenant Ranch Trucking so it is only available on our routes. We are also always looking for men with integrity who have their CDL to drive for us. We can’t expand without the drivers. We a family friendly company and give our drivers one week off every month to be at home with their families. We also pay extra on our insurance so children and spouses can come along on the routes. Hopefully many of you will be benefited by their services. I’ve never once been disappointed with Azure Standard, and love that so many of you will have the delivery service of Covenant Ranch Trucking. Mrs. Joseph Wood, who advertises with us here at Heavenly Homemakers, is always trying to keep me up to date on the latest great news from Azure Standard so that I can pass it on to you. Her husband is one of their trusted truck drivers, and she and her family are extremely dedicated to serving through Azure. If you’ve been reading my posts about Azure Standard and wishing you had access to this service, you’re going to be excited to read this news! Azure Standard is going to be adding IL, IN, IA and parts of TN the first of January. They will also be rearranging the current M-1 and M-2 routes into five smaller routes so that food can be fresher when delivered to customers. This is allowing them to add new areas of CO, NM, KS, OK, TX, MO and AR if there were families in those states that used to be off route. Because of these changes, Azure Standard is super busy, which means that it would be best at this time for you to contact Mrs. Joseph Wood instead of contacting Azure Standard themselves. To learn more or to see about setting up a drop point in your area, call 785-633-3152. Or, if you’d rather contact her via email you can do that at: mrsjosephwood @ gmail dot com. Also, be sure follow the Azure Standard Facebook page for regular updates and great Azure Standard information! If your location was not mentioned today, don’t despair! As you can see, Azure Standard is constantly working to expand and meet more needs. Your state might be coming soon! Remember how I told you about how I grocery shop when I shared our 2011 Grocery Budget? I don’t usually buy much at grocery stores; I buy in bulk from co-ops; I purchase from local farmers. Some months I hardly buy anything, some months I buy a lot. This month, February, would be an example of me buying a LOT…and you get to witness it here today! Everything just sort of hit all at once this month, but that’s okay. There is money in our grocery budget. I just wait to spend it until I need it! This month’s order was a pricey one because I ordered a case of butter. See that box up there with two pounds of butter on top? There are 28 more pounds in that box. It’s a hefty investment all at once, but we go through a lot of butter and it’s nice just to have it in the freezer for when we need it. I can avoid going to the store as often this way, plus, this butter is much higher quality! My co-op order total (with delivery fee included) was $254.00…quite a bit more than I normally spend on an Azure Standard order. It was the butter. The cost of butter is rising I’ve noticed. My case of 30 pounds was $108. Ouch. And yet, I’m paying for high quality butter, and this will last us a while. By “a while”, I mean that I really have no idea how long it will last us. Three months maybe? Maybe not that long. 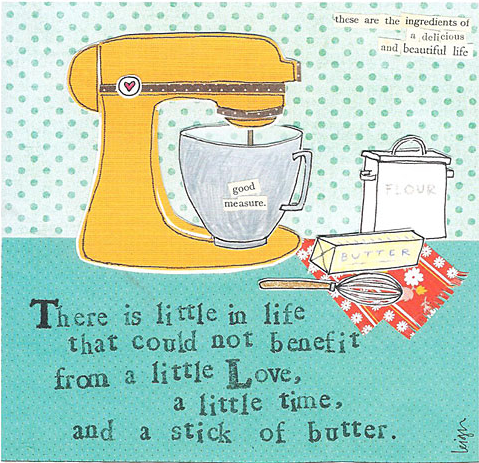 Depends on how much baking I’ll need to do. If you did the math on that, you would have found that I have spent $760 on bulk groceries (so far) this month. This isn’t including what we’ve spent on milk and eggs, or what we will spend on bananas and a few other little things that we do get at the grocery store. Sound like a lot?! :) Maybe. But this is how grocery shopping and spending works for us. We buy food when we need it, we don’t buy food when we don’t. 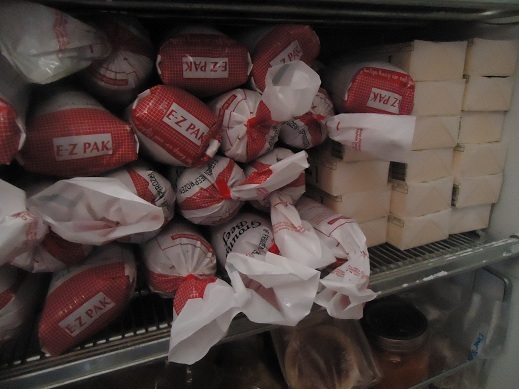 We are blessed to have three freezers and plenty of pantry storage for bulk purchases. I am amazed at how much money we save by buying our food this way. And can I tell you my little secret? I love having a wide variety of all of our staples on hand at all times. Rarely am I out of any basic ingredient, which means that at just about any time, I can cook up any recipe I have a hankering to cook up. This makes meal planning so much easier for me and helps me run my kitchen so much more efficiently. So, how do YOU buy groceries? Share what works well for you! Azure Standard: How Does it Work? Here’s a little Q & A for you to let you know if it’s possible for you to order from my favorite food co-op, Azure Standard. You can see some samples of my monthly grocery orders here and here. Check out these jars of golden honey…YUM! Azure Standard is a food delivery service specializing in offering top notch, organic and natural products. 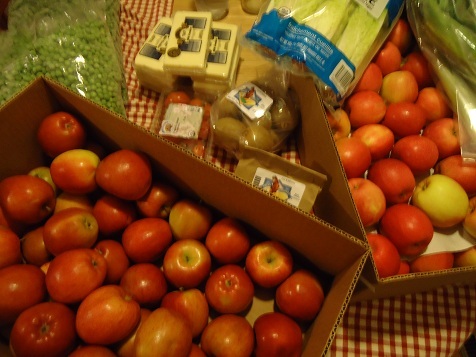 These folks provide my family with amazing organic produce and groceries each month. I am constanly blown away by their prices, especially for organic produce. Usually their organic fruits and vegetables are LESS EXPENSIVE than the non-organic produce I can find at my local grocery stores. They are SUPER easy to work with and incredibly nice. Read all about Azure Standard and what they stand for here. Are they awesome or what? Who does Azure Standard deliver to? If you are from CO, NM, OK, KS AR, MO, TX, IA, IL, IN, LA, KY, TN, or north west part of MS – you’ll definitely want to click over to Covenant Ranch Trucking to learn about the services they provide for Azure! If Azure Standard doesn’t have a truck route to my area, can I still order? Yes! If you are unable to be a part of a co-op/truck delivery route…you can still order (most items) and have them delivered UPS or by mail. They deliver all over the U.S. and the world (if you make special arrangements). Shipping costs may be high, but it’s worth a check. How often do the trucks deliver? Yes…if you’re right along the truck route, there is a minimum $550 order…but that’s total, for everyone who is ordering. If you get a few families involved, your minimum is met pretty easily. Your individual order must also be at least $50. If your order is under that amount, just combine it with a friend. Their prices for these organic foods are incredible! Are there any hidden fees? Hidden, no. But some states (like mine) are subject to a delivery fee. I DON’T mind the delivery charge at all. If I didn’t have Azure Standard, I’d have to drive 2 hours one way to get food like this, and then the food prices would be a LOT higher. My delivery charge is less than my fuel cost would be to drive the 2 hours, plus the food costs less. I happily pay the delivery percentage on my order. Hey, I can’t see the prices on their website! How can I see their prices? Call them and set up an account. (541-467-2230) They’ll give you an account number and password, then you can log into their site and see all their prices. You can also fill out the form here to request a free catalog. Do I have to order in bulk? I don’t have much storage space. You can order in bulk, but you can also order small amounts of a product. I love this feature! 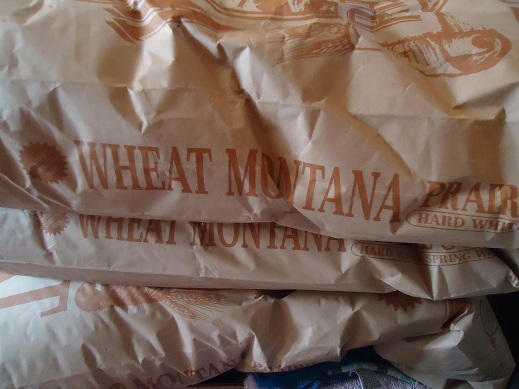 You can order 50 pounds of oats, or just five pounds. You can order an entire case of organic ketchup, or just one bottle. Does Azure Standard have a nice selection of gluten free food? Yes. Click here to see some of their gluten free products…then click around looking for your other favorites. What am I forgetting here? What other questions do you have about Azure Standard? Possible Azure Standard Delivery Route in North Texas! I received an email from Shelly (thank you!!) who has been in touch with some of the folks at Azure Standard about a possible delivery route in the DFW area! I’m so happy for all of you! If you would be interested in having Azure Standard deliver their awesome food to you in North Texas, you need to email penningtonfam at yahoo.com to let them know of your interest. They are trying to see how many people may want to take advantage of their delivery route as they make plans to possibly expand. If you live in the DFW area, give Dianne Pennington a quick email to say YES PLEASE bring a truck my way! Tell all your friends in the area to do the same! I promise you will LOVE the benefit of having Azure Standard deliver to you! I wanted to give you fair warning. I’m going to be writing a few posts soon explaining the benefits and great aspects of ordering food from Azure Standard. But if Azure Standard DOES deliver to your area, I’m hoping to encourage more of you to take advantage of Azure Standard’s wonderful services if you can. I’ll be posting sales and special features as often as I’m able. Maybe weekly (if they have anything cool in their bargain bin), or just monthly as they update their produce and sales. Azure Standard isn’t paying me to say all of this (although if they want to, I’d be okay with that). I just LOVE Azure Standard and want to spread the wholesome food love.